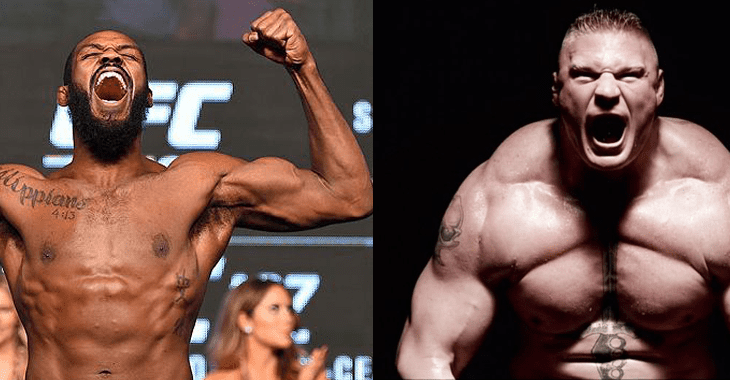 Remember talk of that fight between WWE superstar and former UFC light heavyweight champion Jon Jones…the one which would have never happened? According to Brendan Schaub and Lesnar’s friend Mike Goldberg, it was gonna happen. Damn! Jones’ latest scandal involving a failed test conducted by USADA will likely see him suspended for a long time. At the conclusion of his light heavyweight title-winning bout against Daniel Cormier at UFC 214, Jones had called out WWE superstar Lesnar for a money-spinning bout inside the octagon. “If [Brock Lesnar] wants to return, I think he does, I think he does. I think it may be in his plans. Although, yeah, a month ago [it was more likely]. [Jon Jones’ testing positive threw a wrench into it]. Yeah, a huge wrench into it, because if it ain’t Jon, there’s nobody big enough. Nobody, there’s nobody there for him to fight. Conor [McGregor], that’s it, and I only say Conor because he opened his mouth about all the WWE guys.” Goldberg said on The Fighter and The Kid Podcast. Bellator 183 kicks off this weekend, with a salivating stand-up showdown between Paul Daley and Lorenz Larkin set to light up the cage. Larkin, like Daley, is a former UFC welterweight. Unlike the Englishman, however, Larkin was part of the WME-IMG era. “The big difference for me is that I’m able to hit up Scott,” Larkin said. “And don’t get me wrong, there’s probably people in the UFC who are able to hit up Dana, and just hit him up on any type of call and really talk about stuff, like about what they need. But with Scott, I can just give him a call on the phone and there will be an answer. Or if not that, it’ll be a callback in like 20 minutes and I can talk to him about anything, about the fight, it’s not even an issue. “There’s probably a handful of guys in the UFC that can do that, but with me, that wasn’t the situation. But it is what it is, and [I was] in a position where I couldn’t do all of that and I couldn’t talk business with my boss. “It’s just, it’s freedom,” Larkin added. “Everything is freedom. Me being able to pick out what I want to wear — it’s originality. I don’t have to just conform to what people want me to wear, to do. It’s just freedom of expression. “I never even recognized this guy until he got to the UFC and until I started looking back at his fights in preparation for this fight and I was like, ‘Oh sh*t, he was in Strikeforce while I was there,’” Daley told MMA Fighting. “He didn’t really figure into my thoughts. “You know what,” said Daley, “He’s the champion now and he’s doing work, and I give him props because not a lot of fighters are at the level that he’s at. Give him credit. Tyron Woodley, I’d love to have a rematch with him. I think we had a good fight.